Who amongst us has not coveted our neighbor's goods at least once? I thought so. 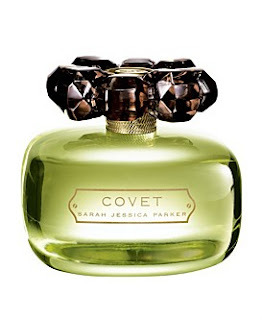 Sarah Jessica Parker must be used to people wanting everything she has (Cavalli, Chanel, Oscar de la Renta and all the rest) -- hence the name for her latest fragrance, simply titled Covet. Open up the gold-lacquered box to reveal a simply stunning bottle, subtly square in shape and topped off with a carved flower stopper in gorgeous faceted jewels. Definitely one to keep on the vanity or in the boudoir! And it smells as amazing as it looks. Smelling faintly of chocolate and musk at first, it's absolutely enticing and makes you want to keep spritzing and spritzing until the entire bottle is gone! All of the notes are interesting in their own right, however. Top notes are mostly floral -- geranium leaves, lavender and wet greens laced with chocolate and lavender. Bottom notes are where the musk lies, imbued with vetiver, bois de cashmere, amber and teakwood. And the heart consists of sweet-smelling honeysuckle, magnolia and muget. So whether you're in love with these scents or just think the bottle is to die for, I think we can all agree that this fragrance is one worth coveting. Get your own for only $68 at Macys.com -- and make other people start coveting you.